Teamwork is not always filled with sunshine and rainbows. When people with different personalities, as well as different demographic and professional backgrounds come together, conflict is inevitable. As the project leader, you will have to act quickly to avoid an escalation of the situation and to resolve the issues between team members effectively. Conflict is not always bad per se. In fact, healthy and constructive conflict can be a trigger for innovation and is beneficial for effective teamwork. We’ve already highlighted the importance of having a diverse team: diverse teams are more productive, innovative and creative. But their differences can also have the reverse effect and ruin your team’s unity in the long run if there is constant conflict. There’s a proverb that says that “prevention is better than curing”. It’s better to avoid letting a conflict turn into something much bigger than it should be. That does not mean to suppress all conflict. As mentioned before, diverse viewpoints and opinions are extremely important if you want to deliver successful projects. Aim at fostering a working environment that is inclusive and ensures that everybody is aware that they can voice their opinion – even if that opinion goes against the grain. However, misunderstandings and miscommunication can quickly cause unconstructive conflicts, and you have to prevent these from developing into real conflicts. Having a clearly defined communication process will help your team communicate with each other more effectively. Also make sure to address issues and problems immediately, even if they seem insignificant – many small problems can quickly accumulate into a big one. So, you were unable to prevent misunderstandings in the first place and are faced with a real conflict – what now? The first step is to acknowledge that there is a problem. The issue won’t simply go away with time. Some might, but many will remain and, like a ticking time bomb, are bound to explode at some point. You know you have to deal with it sooner or later, and we all know that sooner is always better to avoid escalation. Define the problem and its root causes, which will serve as the basis for you to develop a strategy to resolve it with all parties involved. Gather your team and have an open conversation where everybody states their opinions and clarify their stand points. Write down all complaints and comments in a list, and try to identify their underlying positions and assumptions of the matter. Hear out everyone without judgment and make sure that people do not take it personally or attack one another on a personal level. 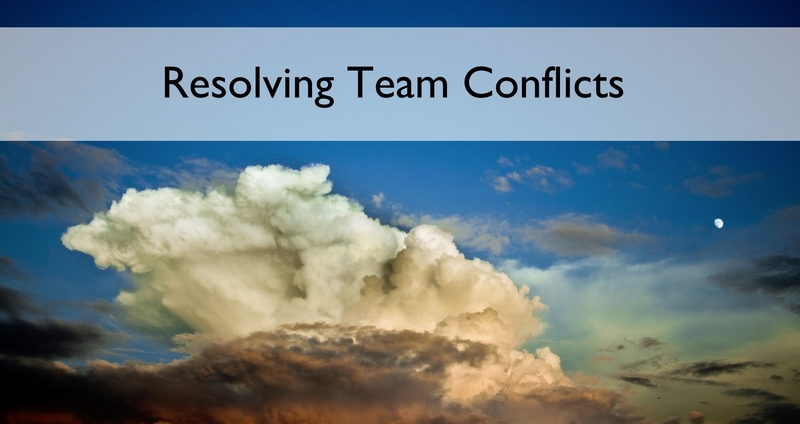 You also need to discuss the impact this conflict has on the team, the project, or even the whole organization. After you have identified and discussed the conflict, it’s time to resolve it. Unresolved conflicts always have a negative impact on the team’s performance and this in turn will have a direct impact on the project’s outcome and the company’s bottom line. So whatever decision you make to resolve the conflict, always keep the main objective of any project in mind: to add value to the organization. There are several ways to resolve a conflict, the one which will make everyone happy is of course the ‘win-win situation’, but that’s rarely achievable. Most of the times you will have to agree on a compromise and that means that one party has to concede to the other, and as a team leader you need to make sure to communicate it to the ‘losing’ party that this is indeed the best course of action. How Project Leaders Can Resolve Team Conflicts - InLoox • Copyright 1999-2019 © InLoox, Inc. All rights reserved.